How do I get to Paris from the airport? RER A serves Disneyland Paris resort, the Champs-Élysées Avenue and the Arc de Triomphe. It connects the cities of Saint-Germain-en-Laye, Cergy and Poissy in the west, to Boissy-Saint-Léger and Marne-la-Vallée in the east, through the city center of Paris. RER B connects Roissy Charles de Gaule airport in the north and Orly airport in the south, to the city center of Paris. It also serves Notre-Dame Cathedral. 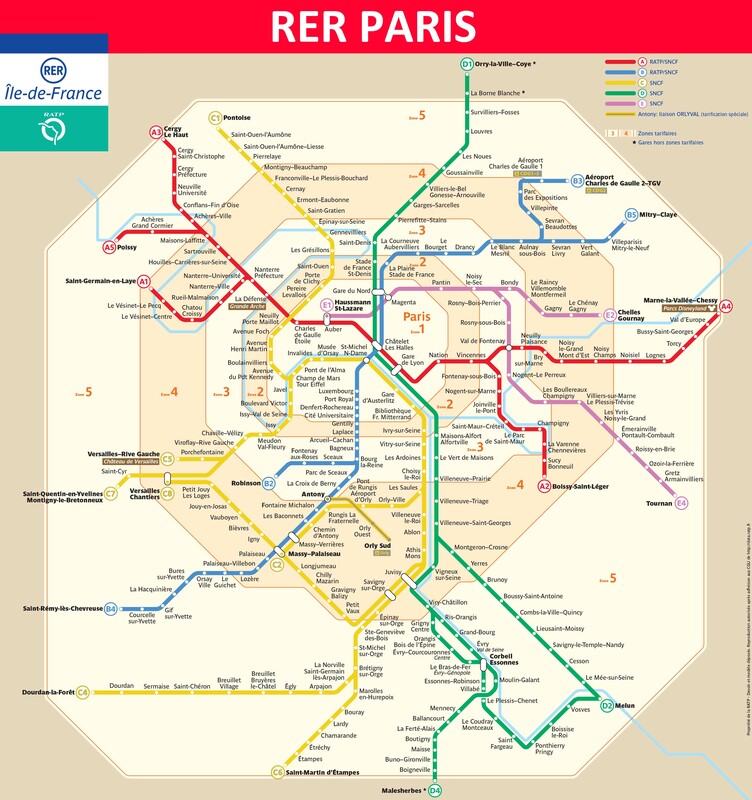 RER C serves the Eiffel Tower, the Palace of Versailles and Notre-Dame Cathedral. It connects the city of Pontoise in the north, to Versailles, Saint-Quentin-en-Yvelines, Dourdan-la-Forêt and Saint-Martin-d´Étampes in the south, through the city center of Paris. RER D serves the Stade de France. It connects the cities of Creil and Orry la Ville in the north, to Melun and Malesherbes in the south, through the city center of Paris. RER E crosses the city of Paris from the east to the train station of Saint-Lazare. It is mostly used by people living in the eastern suburbs to go to Paris. The metro of Paris is composed of 16 lines defined by numbers from 1 to 14 (including line 3 bis and line 7 bis). Line 1 of the parisian metro crosses the French capital from the west to the east, serving important sites such as the Champs-Élysées avenue, the Louvre Museum and the business center of La Défense. Paris metro line 1 offers more connections to other metro and RER than any other metro line in Paris. Line 2 of the metro of Paris serves the northern part of the city by drawing a half circle from the Champs-Élysées avenue to Nation metro station, through Pigalle and Montmartre. Line 3 of the metro of Paris links the northwest to the eastern suburbs of the French capital. It is serving the International Bus Station Gallieni, the Opéra of Paris and also the Père Lachaise cemetery. The line 3 bis of the metro of Paris is the shortest line of the network. It was linked in the past to line 3. The line 4 of the metro of Paris links the northern to the southern suburbs of the French capital. It is serving the 3 biggest train stations of Paris, Gare du Nord, Gare de l’Est and Gare Montparnasse. The line 5 of the parisian metro links the northern suburbs of Paris, to the southwest of the French capital. 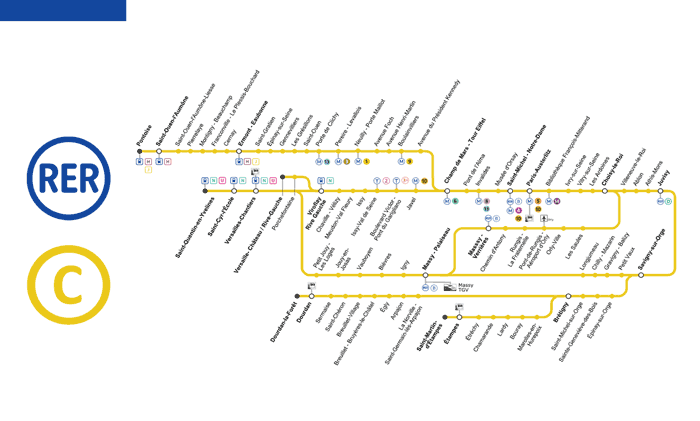 It has connections to many other metro and RER lines, and to 3 important train stations. The line 6 of the metro of Paris serves the southern part of the city by drawing a half circle from the Champs-Élysées avenue to Nation metro station. Part of the line is above ground and offers a beautiful view on the Eiffel Tower. The line 7 of the parisian metro is a metro line which links the city of La Courneuve in the northeast suburbs to the cities of Ivry and Villejuif in the southeast suburbs of Paris, through the city center and the Louvre museum. The line 7 bis of the metro of Paris is one of the shortest lines of the network. It was linked in the past to line 7. The line 8 of the parisian metro is a metro line which links the southwest of Paris to the city of Créteil in the southeast suburbs, through Concorde and the Opera. 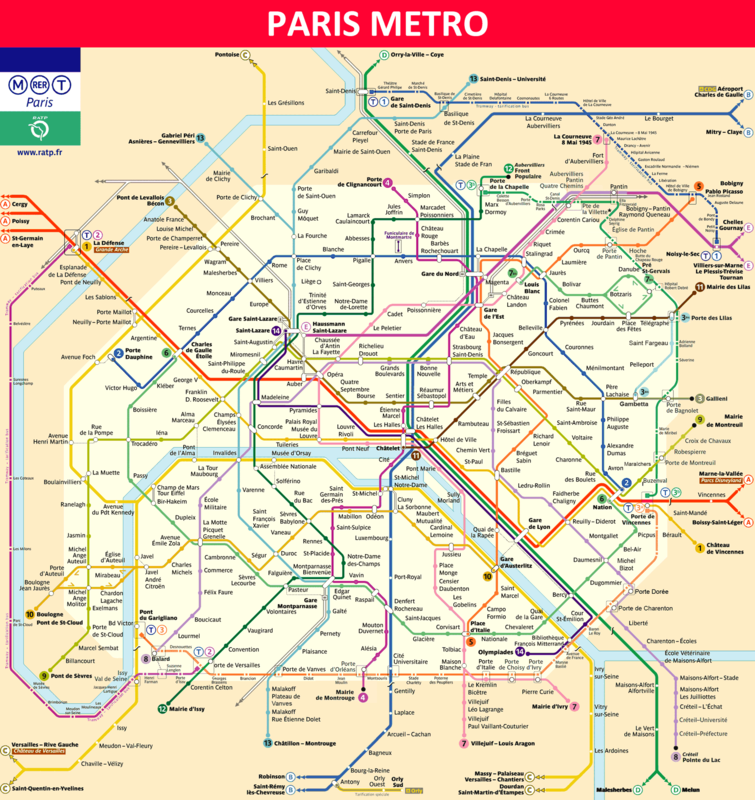 Line 9 of the metro of Paris is a metro line which connects the city of Boulogne-Billancourt in the southwest of Paris, to Montreuil, a city in the eastern suburbs of Paris, through the Eiffel Tower and the Champs-Élysées avenue. The line 10 of the parisian metro is a metro line which connects the city of Boulogne-Billancourt in the southwest of Paris, to the train station Gare d’Austerlitz through the classy 16th Arrondissement. The line 11 of the metro of Paris is a metro line which connects the city of Les Lilas in the northeast of Paris, to Châtelet station. Paris metro line 12 will bring you to Montmartre (Abesses), down to the Champs Élysées (Concorde) and to the well known neighbourhood of Pigalle. Line 13 of the metro of Paris links the northern and southern suburbs of Paris through the city center, the Champs Élysées and the Invalides. Paris metro line 14 will bring you to the train stations of Saint Lazare and Gare de Lyon. It is mainly a line for connection to other metro lines. It is the only metro line in Paris to be operated completely automatically.